MAKITA BRUSHLESS LXT 18V 8 PIECE KIT. 3 LXT BATTERIES. 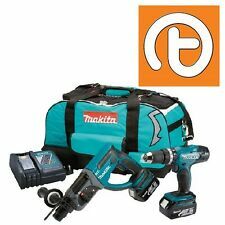 Makita DLX6068 18v LXT 6pc Combi Kit - Includes 3 x 3.0ah Batteries Stock Code: DLX6068-3AH This lithium-Ion LXT kit contains a 13mm 2 Speed LXT Combi Drill, SDS Plus LXT Rotary Hammer Drill, cordless jigsaw with tool less change and builtin job light,165mm LXT Circular Saw, 6.35mm (1/4") LXT Impact Driver and 3 x 18 volt 3.0Ah Lithium-Ion battery packs. Part of the Makita 18vLithium-Ion LXT range.The Li-ion range delivers 430% more working capacity during it's lifetime compared to Ni-Cad and is 40% Lighter than Ni-MH.The Li-ion has minimal depletion of power during use or in storage over it's lifetime. The Slide on battery features Foam cell technology -firm holding with multi contacts and shock absorbing pack,will not puncture and remains cool even in heavy use.Supplied with a.
Makita DLX6068PT 18v LXT 6pc Combi Kit - Includes 3 x 5.0ah Batteries Stock Code: DLX6068PT This lithium-Ion LXT kit contains a 13mm 2 Speed LXT Combi Drill, SDS Plus LXT Rotary Hammer Drill, cordless jigsaw with tool less change and builtin job light,165mm LXT Circular Saw, 6.35mm (1/4") LXT Impact Driver and 3 x 18 volt 5.0Ah Lithium-Ion battery packs. Part of the Makita 18vLithium-Ion LXT range.The Li-ion range delivers 430% more working capacity during it's lifetime compared to Ni-Cad and is 40% Lighter than Ni-MH.The Li-ion has minimal depletion of power during use or in storage over it's lifetime. The Slide on battery features Foam cell technology -firm holding with multi contacts and shock absorbing pack,will not puncture and remains cool even in heavy use.Supplied . Specification DHP453Z Combi Drill Noise Sound Pressure: 78 Db(A). 16 Torque Settings. Weight: 1.7kg. Weight: 3.2kg. No Load Speed: 0-1100rpm. Max Blows: 4000bpm. DTD153 IMPACT DRIVER. BL1840 X 2 4amp batteries.